"From my childhood in Georgia, I remember a big bush of Hydrangeas - with large blooms with colors that would vary. Blue were my favorites. One summer when visiting Georgia, I painted one which took a lot of time since there were so many petals but I was happy with the results - the painting was true both to my memory and the flower I was studying. 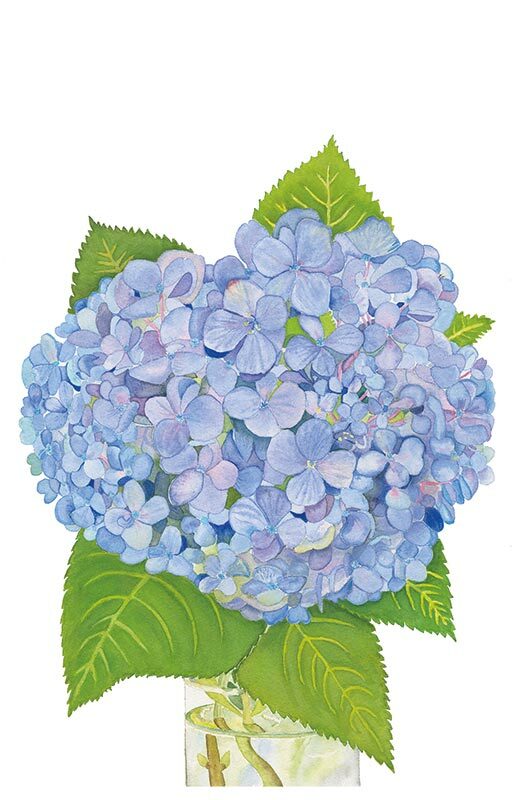 The blossoms of Hydrangea are treasured for both their boldness and delicacy. In the language of flowers, Hydrangeas symbolize heartfelt emotions, friendship, devotion, perseverence, sincerity and understanding. The calming blue shades have also come to mean peace and tranquility. Hydrangea is sometimes called "seven-bark," a name which refers to the shrub's stem bark, which peels off in seven thin layers of different colors. These shrubs were used by the Cherokee Indians who belived in their medicinal value."